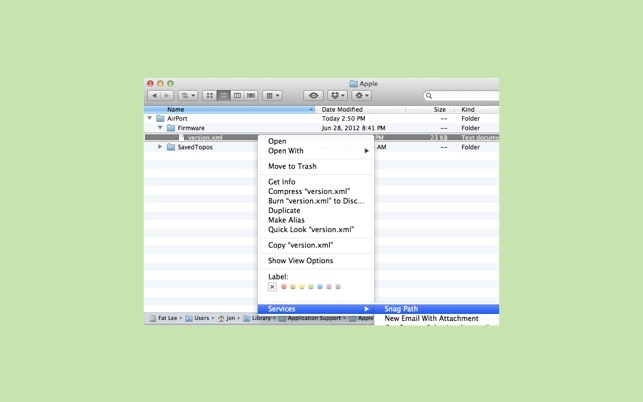 * Right-click a Finder item, choose Snag Path, and the path is instantly copied to your clipboard. * Supports multiple path formats. Choose from POSIX, HFS, File, or Windows. * Optionally insert a prefix or suffix to the snagged path. * Copies multiple items at once. Items are separated with a configurable delimiter string. * Optionally escapes (with a backslash) special characters. * Optionally place double quote characters around the entire path. * Optionally replaces your home directory with the tilde (~) character. * Optionally apply configurable text-substitution rules to the snagged path. * Create as many configurations (Translators) as you want. * Specify a default Translator that will be applied every time you invoke the service. * Hold down the option key when invoking the service to choose from your entire list of Translators if you don't want the default. * Growl support. Displays a notification when the path is snagged. * Notification Center support. Displays a notification when the path is snagged. * Path snagging history. Click a notification in Notification Center, and that path will be re-copied to your clipboard. * Option to automatically quit after snagging the path. Fix for El Capitan compatibility. Does what it says. Nice options to customize exactly how you want the path to be grabbed (escaping out special characters, for example). I'm sure App Store requirements forced the developer to use the Services menu as the way to implement this. That's ok, but it would be nice if this would show up as a contextual menu in the Finder without having to navigate to the Services submenu. Hopefully someday the nwe Extensions feature introduced in Yosemite will allow the devloper to pull this out of the Services submenu and make it a little easier to access (perhaps with its own submenu, to pick the style of path one wants). Note that there is a program called TotalFinder that implements this feature more like what I'd prefer, but you can't get that in the App Store because it doesn't play by Apple's rules (it really can't play by Apple's rules and implement all its features). I've stopped using TotalFinder because I feel like it introduces some compatibility/stability issues and I just don't need all of its features. 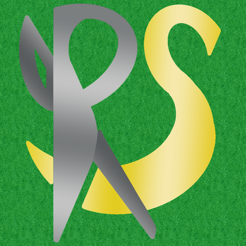 PathSnagger does something that sounds like it's part of the OS: it allows you to copy the path of a selected file to the clipboard. Out of the box, it does this fairly simply-- two clicks and I have a path copied. But the configuration options are what make this utility shine: being able to configure different path options (colons like HFS or slashes like Unix, or paths relative to your home directory) means that you can create different workflows for different purposes. Pro tip: assign a keystroke for the service in the Keyboard Pref Pane to make it even faster. 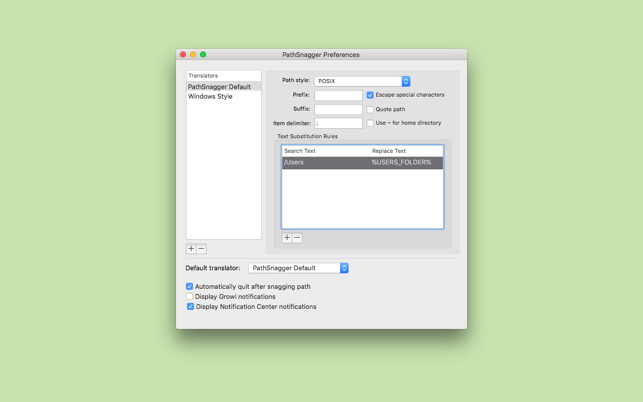 I’ve been using PathSnagger for many years prior to it being available on the App Store. It’s an indispensible tool in my OS X toolbox.